As informal carers, older women of working age face many risks of social exclusion. Carers who stop being in employment, even part-time, have a significantly higher risk of poverty and social exclusion, health issues, feelings of overburdening and social isolation (Eurofound, European Quality of Life Survey 2016). Depending on the social protection arrangements existing in their member state, they might have to rely on minimum income, if these are accessible to carers. 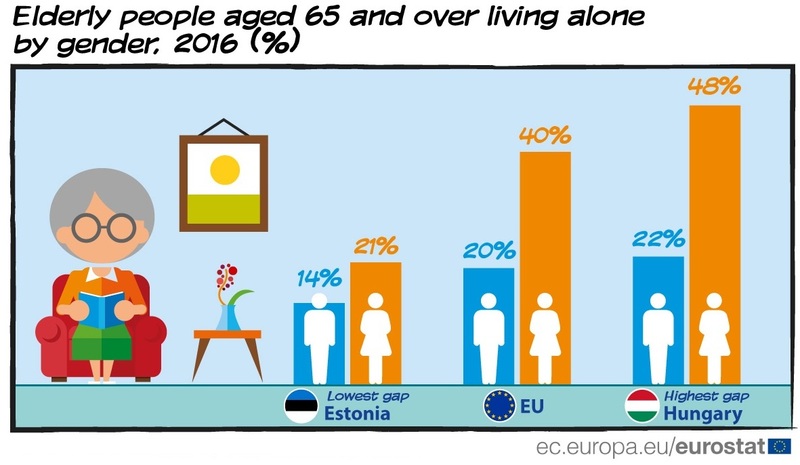 In pension age, older women face a gender pension gap of 38% (European Commission, Pension Adequacy Report 2018) relative to men. This exposes them to higher risks of poverty and social exclusion in old age. In the age group 75+, older women face a risk of poverty and social exclusion of 23% vs 15% for older men, while the risk-of-poverty gap is only of 2% between men and women for the total population. While the labour market situation of women is slowly improving, which will have a positive impact on their pensions, the strengthening of the link between pension contributions and benefits and increasing reliance on private pensions is going to disadvantage women, who pay lower and less numerous contributions to the pension system. The reason for this are persisting gender pay, care and employment gap, as well as gender segregation in the labour market. An additional form of discrimination are differential pension ages between women and men: they structurally lead to shorter careers for women, and thereby also enshrine differences in pension benefits, as even women with a full career will not have the same benefits than men with a full career. While the EU is pushing, through recommendations in the EU Semester and partly also through legal action based on the Gender Equality Directive, to align pension ages between women and men, some member states have recently reintroduced larger differences. Older women living alone are a group that should especially be highlighted: because women are often younger than their partner and due to differences in life expectancy, women are more likely to live alone in very old age. This means that they have to bear alone the costs of a household that was previously shared with their partner and their pension income is much lower. Survivors’ pensions are a powerful tool to reduce the risk of poverty and social exclusion of older women but are questioned more and more in debates on pension reforms. We highlight the problem of female old-age poverty and the gender pension gap in all its statements on adequate income and poverty and social exclusion, such as in the European Semester, in our response to the Commission’s Pension Adequacy Report, in the High Level on Pensions, etc. We cooperate with the European Women’s Lobby on issues of gender inequalities in old age and we issue a statement to mark the International day of Women every year.